September 14, 1962 – Announcement was made by Bishop Emmet M. Walsh that St. Luke Mission would be established, comprised of sections of St. Nicholas, St. Dominic, St. Charles, and Holy Family Parishes. Fr. Edward J. Dierker was appointed as Administrator, and Fr. Donald J. Oser, Assistant. 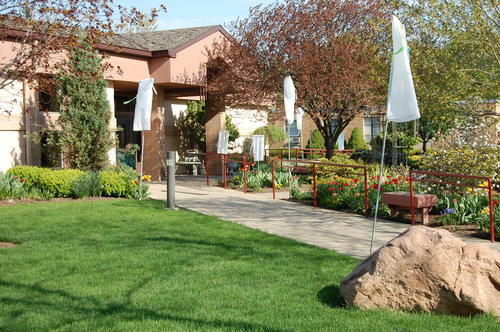 September 23, 1962 – Three Sunday Masses were celebrated at Robinwood Lane School. Due to the large turnout, the number of Masses increased to five on October 7th. CCD classes were held for elementary and high school students in Robinwood classrooms. March 1, 1964 – Ground was broken for $1.2 million physical plant to include School, Church and Rectory. Construction on the school and rectory phase was delayed until mid-April due to rainy weather. June 12, 1964 – St. Luke Mission was elevated to the status of Parish, and name was changed to St. Luke Catholic Church. September 8, 1964 – With firm belief in Catholic education for the Parish youth, school opens for grades 1 – 4, with two classes of each grade level, under the direction of the Ursuline Sisters, with Sr. Miriam Engles as Principal. November 29, 1964 – The first Sunday of Advent was celebrated in our own worship space, using the school auditorium as a temporary church. January 27, 1965 – Although construction was not yet completed, the priests moved into the Rectory. August 22, 1965 – Plant was dedicated by then Auxiliary Bishop, James W. Malone, consisting of the School with fourteen classrooms, auditorium and offices, and the rectory with administrative offices and living quarters for the priests. Construction costs had exceeded estimates, and plans for the permanent Church are put on hold. School enrollment continued to rise, and as anticipated one grade level was added per year. 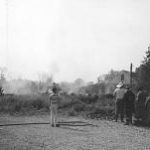 1965 – 1972 – Despite the cloud of heavy debt and the economic decline of the community, the life of St. Luke Parish grew. Support organizations continued to be the center of activity, ministries developed, and parish life thrived. 1972 – 1978 – Fr. John P. Ashton was appointed pastor in 1972, and measures were begun to reduce the large debt hanging over the parish, including negotiating with the diocese a moratorium on the Diocesan assessments. The annual summer festival was started to help with the debt reduction, and the parishioners willingness to help added to the fun and fellowship each year. 1978 – 1985 – Fr. Ronald M. Klingler was appointed pastor on September 1, 1978. He continued the measures that Fr. Ashton had implemented, with the goal of eliminating the debt and meeting the Diocesan obligations. 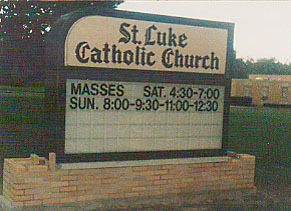 October 18, 1985 – On the Feast of St. Luke, in conjunction with former pastors and the community of faith, a celebration was held and the parish debt was retired. The dream of a permanent church that was part of the original vision remains in the hearts and minds of all parishioners. August 3, 1988 – Fr. Joseph A. Fata becomes the fourth pastor appointed to St. Luke. Parish life continues to grow with new organizations and ministries. Although the goal of meeting the monthly diocesan obligations has not been realized, the yearning for a separate worship space is still evident. 1991 – 1992 – Entered into the research phase of a building project. Diocesan representatives, Parish Council, Liturgy & Finance Committees study the possibility of building a newchurch. In September of 1992, Bishop James Malonegives permission to enter into phase two, consisting offund raising, financial feasibility, and selecting anarchitect. A Building Fund Committee is established, andthe parish at large is informed of the project. 1993 – The General Building Fund Appeal begins. Meetings areheld for the parishioners’ formation and input, andpresentations are made by the architect and Diocesanrepresentatives. 1994 – Plans for the seating arrangement are finalized and the parish is informed of the theological background and format of the new space. May 28,1995 – With the goal of two-thirds of the total project costhaving been raised, a prayer service and ground breakingceremonyis held. July 24, 1995 – At the same time the Festival concessions are moving out, construction equipment is moving in. Work moves along quickly, in part due to excellent weather. April 21, 1996 – The Official Closing Of The Worship Space takes place after the 11:30 mass. The altar, chair and other artifacts are moved to the new worship space. April 27, 1996 – The first Mass is celebrated in the new church. Alleluia! 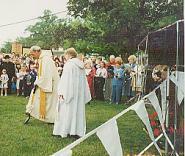 May 5, 1996 – Dedication Mass is celebrated with Bishop Thomas J. Tobin presiding. 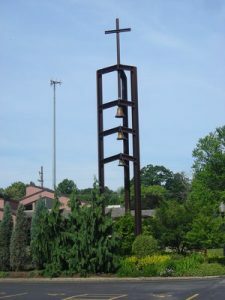 September, 1999 – Through the generosity of one anonymous donor, the bell tower and bells were added to the church landscape. The main bell is an exact replica on a smaller scale of a bell commissioned by Pope John Paul II for the Vatican to ring in the new millennium. Casting for the St. Luke Bell began in 1997. The inscription reads: “1997 – Tertio Millennio Adveniente” and carries the Papal insignia with the motto TOTUS TUUS. An image of St. Luke with the words “For the Faithful of St. Luke Parish” was added. Two smaller bells were added to the tower, purchased from the Verdin Company. They ring daily for the Angeles, for weekend Masses, weddings and funerals. They were rung for the first time on New Year, 2000.
not being met. A pledge campaign was launched and a loan was taken out to pay our back assessments, and will be paid off by the end of 2002. Although the financial picture is not perfect, it is far better than it was, due to the faith and dedication of the parishioners of St. Luke. June, 2016 – Father Gerald M. DeLucia was appointed Administrator during Father Joseph A. Fata’s leave of absence. August 1, 2016 – Father Fata passed away. October, 2016 – Father DeLucia was named Pastor. August, 2017 – Rev. John E. Keehner was named Canonical Pastor and Sr. Mary Alyce Koval, OSU was named Parish Leader.